When I ride and run solo, I like to listen to music or podcasts. Of course, this makes my friend Mike crazy, but I do it anyways. To be safe, I only put a headphone in my right ear so I can hear cars and the surroundings. 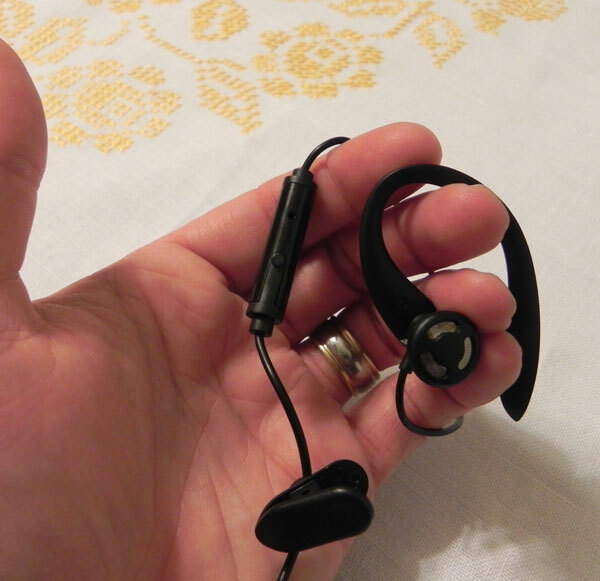 For a couple years, I've used the Apple Earphones with the built-in mic/clicker. The problem with this is that the left earbud just kind of dangles in my jersey, sometimes tapping on my heart rate monitor. At Christmas, I got One Good Earbud, to try out. The idea is pretty simple, make headphones with one good earbud for people that are active and need to hear out of one ear. The left and right channels are mixed into a mono feed so you don't miss anything. They make several types and versions for left or right ears. I got the over the ear version for the right side. I've been on a few rides and runs with them now and I pronounce them Cruft-worthy. Everything works as expected and I think the larger button on the mic is good, especially when wearing gloves. Much easier to find without having to slow down and fiddle with finding it. There's also a small clip that I find useful when I run to keep the cable from bouncing. The mic quality is pretty good and I can still receive calls while running and riding without stopping. The one drawback is no volume up or down buttons. I didn't use them often, but they were handy. No reason not to get them, but you should be aware if you don't equalize your music tracks. Priced between $20-30, depending on the model you choose, it's a great value. Update: One Good Earbud changed their name to Far End Gear, so I changed the linkage.